“We walked from Slough [where the coach had brought them from Bath] over to Datchet, where we were obliged to sleep at the public house near the Church, and were glad to see on our first waking the wagon with all the tubes etc safely arrived.” This was how Caroline Herschel described her arrival in the village with her brothers William and Alexander, and the night they spent at the Royal Stag on August 1st 1782. William’s career in astronomy was at a high point; in 1781 he had discovered the first new planet to have been observed since ancient times, then called Georgium Sidus in honour of King George III, but later named Uranus. He was on his way to settle in Datchet as being conveniently near to Windsor Castle, since the King had offered him the post of King’s Astronomer. The chief duty this would entail was to demonstrate his telescopes and discoveries to the King and Court. (It was quite distinct from the post of ‘Astronomer Royal’ which was based at Greenwich and chiefly involved with matters of navigation.) For the first time, William would have a salary and could stop giving the music lessons which brought in money but which he considered a waste of his time. During the four years they spent at Datchet, William was working at his usual frantic pace, not only in observing the night sky whenever it was clear enough and taking telescopes to Windsor to edify the Royal family, but also developing ever larger and better instruments. The efficiency of telescopes depends very much on the size and quality of the mirrors used, which at that time were made from polished metal rather than glass. William organised the whole complex process of casting and polishing as well as making and mounting the tubes in wooden frames with ladders, all of which employed ‘the carpenters and smiths of Datchet in daily requisition’. Caroline was a competent astronomer in her own right, making and recording her own observations as well as spending nights outside operating the movement of the telescope and writing down the notes dictated by her brother. All this activity required space, both for the frames and the range of elevation of the great telescopes, and stables or other outhouses for construction and storage. 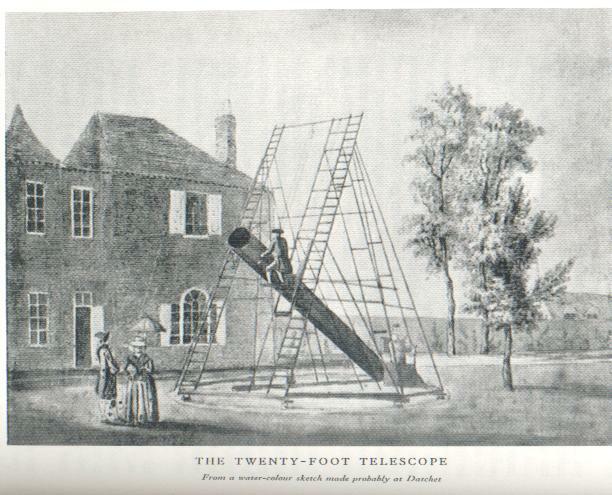 During his time at Datchet William was building a 20ft telescope using a mirror 18.8 inches in diameter, which turned out to be the most efficient of any he made including the great 40ft one he built later at Slough. It has been said that the Herschels lived in Satis House, demolished in the 1970s, but that is not so, and they actually lived was a little further east along the Horton Road at the Lawns. Most of the complex straggling units of this house were later demolished, including the Herschel’s dwelling. 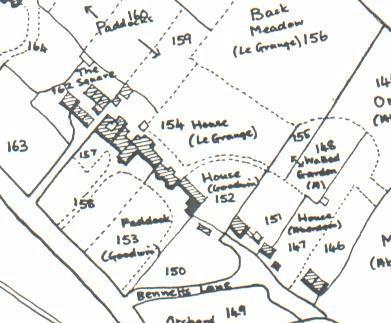 Land Tax listings, which recorded owners and occupiers, confirm William and Caroline’s tenancy in 1785 at the east end of the Lawns house. The best current guess is the second block from the east of the complex, which appears from the map to have two bay windows at the front. Any of these tenements would have had a long meadow at the back, as described by Caroline. The Herschels did not stay here long, due to the damp, foggy and unhealthy weather, to which William was constantly exposed and which made him ill – rubbing himself with a raw onion was not sufficient protection ! Caroline complained bitterly on her arrival in the village about the lack of reliable servants; one who had been appointed for them was in jail by the time they arrived, and the gardeners’ wife was of no use at all except to show her the shops. These were no better – Caroline was scandalised by the price of eggs and meat, and refused to do business with the village butcher who she complained ‘would not give her honest weight’. This would have been Stevens at 20 High Street, still a butcher’s shop until the 1970s and now owned by John and Margaret Partington. William and Caroline spent a brief time at Old Windsor after leaving Datchet, but left for Slough after problems with their landlady. There they settled for the rest of William’s life, although after his marriage Caroline, his devoted partner and long-suffering housekeeper, eventually retired to obscurity in Germany. The discoveries William had made by his death in 1822 are quite astounding and way beyond his time. Apart from discovering Uranus, he identified the infra-red region of the spectrum and was the first person to understand that light and heat are part of the same sort of energy. He found a sixth moon of Saturn, mapped thousands of nebulae and speculated correctly on the shape of the Milky Way. William sought a coherent theory of the universe and understood its immensity. He also wrote prophetically, though it was not proved for another 100 years: ‘I have looked further into space than any human being did before me. I have seen stars whose light, it will be proved, has taken two million years to reach us’. With thanks to Commander Anthony Fanning, who delivered a fascinating talk on the Herschels for Datchet Village Society.